Your website is the online face you give to the world to tell them who you are, what you do, and why you are the best company to work with. Thinking about changing it should be handled with care and thoughtfulness. A good place to start is by defining the goals of your website. Those goals will help you keep the vision as you navigate all the decisions you have to make along the way. Picking colors, fonts, layouts, pictures, site structure can all be overwhelming unless you know the reasons you are undertaking this process. In my 20+ years (yeah, I think that’s a long time too) building websites, I have been in many meetings discussing site redesigns. There are many, many reasons given for why the new website will be so much better than the current one. Sometimes these reasons get political in larger companies, sometimes they get personal, but the best reasons are the ones that drive the business forward. 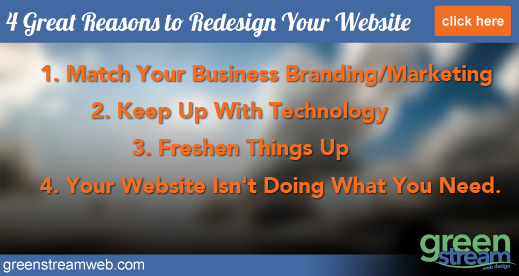 I’d like to offer my top 4 reasons you should redesign your website. Having a cohesive marketing message and branding across all media is so very important. Really big, global businesses like Nike and Microsoft need to make sure their message has the same look and feel in print, retail and, of course web. A company with a big marketing budget will re-design their website whenever they have a new campaign coming out. Now, I’m not suggesting you need to do that, but it is worthwhile to think about how all of your marketing pieces fit together. When it comes to your website, I like to say that it is your online home base. It is the only property that you can completely control the look and feel and own the content. Facebook, twitter and Google+ retain ownership to some level of your content, comments, and so forth. Using those all as tools to put your brand out into the world is a great thing, but you should be wanting to bring them back to your website where you can control the entire experience from colors, graphics and fonts to the various messages and calls-to-action you have. Deciding to re-design your website for branding/marketing reasons should be done in conjunction with your entire marketing efforts. It is wise to include as many of your team in the process as possible so everybody knows what is going with the website and why. Also, when you sit down with your intrepid web designers, make sure you explain your brand and marketing plans fully to make sure it’s included at all levels. Technology is a fickle mistress for many of us, to which it seems, constant attention must be paid. You don’t want to lose customers because you didn’t implement the latest and greatest, but you also don’t need to be changing your website everytime a new tool or method comes out. Recently, mobile devices have just about taken over the bulk of online traffic. We consistently see over half (sometimes way over half) of all traffic to websites we manage comes from some form of a mobile device. For that reason, last April (2015), Google decided to change their search algorithm to heavily penalize sites that weren’t mobile friendly (click here to read more about that). This is a great reason to re-design your website due to technology. This might be the most satisfying reason to give your website the visual overhaul. After a while everything gets old, the shiny-ness wears off and you just want to change something, anything, to breath new life into your website. Plus, through the process of re-designing, you can revisit and tweak things like your logo, letterhead and more. There is a little bit of a downside to this reason for re-designing. Sometimes your customers just like the way things were. Changing everything might be a bit of a shock to them, so it’s usually best to consider the end users when making all these changes. You might think about leaving some things the same, like the navigation of your site or the way people find certain things. You might think about putting out a survey to your customer list, asking them what changes they would like to see. It accomplishes two things: 1st you might get some good ideas and feedback that helps your business grow, and 2nd it tips people off that changes are coming. It’s can give your site refresh a bit of a soft landing when you are ready to launch. 4. Your Website Isn’t Doing What You Need. This is possibly the best reason to re-visit the design of your website. If it just isn’t selling products, creating leads or otherwise helping grow your business, it may be time to step back and re-think your online presence. Start this process by setting goals. If you sell things online, those goals can be simple, sell more product x, or create more orders with multiple products. For many of us though, we are looking for qualified leads to follow up on. Deciding what you want your website to do for you can be a bit of a moving target and seemingly hard to track. A real simple goal might be to have people fill out a form to request a quote. Setting a goal like that will greatly inform what the design should look like, and act as a measuring stick to constantly go back to and make sure the design is leading people towards that goal. A real simple goal might be to have people fill out a form to request a quote. Setting a goal like that will greatly inform what the design should look like, and act as a measuring stick to constantly go back to and make sure the design is leading people towards that goal. Whatever your reason, make sure to have some fun with it, dream about the future and include people in the process. When it’s all said and done, you want to look at the finished product and be proud of what you have done and look forward to all the new customers you’ll get to work with as a result of your cool new website. Oh, and if you want us to help you through the process, we would love to sit down and chat about it with you. Click on the banner below to read more about how we can help you create the best website for your business.